« Healed, Strengthened and Ready for Battle! Israel’s first capital for 369 years where Joshua asked the children of Israel: “How long will you be slack to come and to possess the land the Lord gave you” The place where the Tabernacle was erected and where the land was divided among the Tribes, where the Lord’s yearly festival was celebrated and where pilgrims prostrated and brought sacrificial offerings. 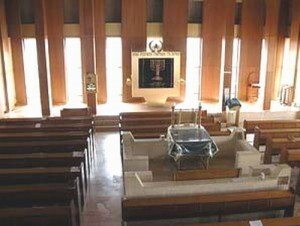 You will notice the Altar in the middle, and that the Ark is built to carry like the one Joshua brought to Shiloh. The ceiling is lambs wool and around the sides there are gold strips. There is a Laver and the doors to enter are one small and one large. There are five pillars in the front and 8 in the back. There is an inner and outer court. But what is more important on the Sabbath it is full of Jews worshiping and praying for Messiah to come. They have returned to the land of their forefathers, praying to the God of Abraham Isaac and Jacob. I have spent many Sabbaths in Shiloh as we have many friends there. 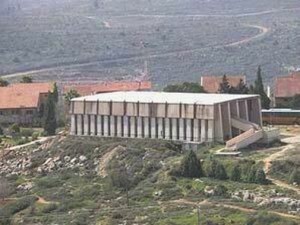 And I can tell you from personal experience when praying in this place on the Sabbath you can feel the power of the Ruach Ha Koddesh so strong it is difficult to even stand. Where Hannah prayed and where the Prophet Samuel Ministered, one of the oldest places in all of Israel that can be verified to be the actual place where Hannah prayed is near the Tel of Shiloh. I wrote and article on Shiloh a few years ago but felt like doing it again considering that this corrupt government would now give it away to the Arabs as a reward for killing us. I just wanted to be sure everyone knew how important this place is to us Jews. The Arabs should never be allowed to do to his place what they did to Joseph Tomb or to over 40 Synagogues in the Old City from 1948 to 1967. 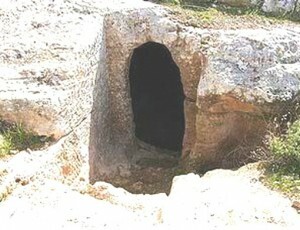 Near this cave is also found a Mikvah (ritual bath) with 6 descending steps, it is close to the original location of the Miskan (Temple). 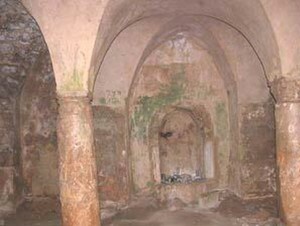 It would have been the place the High Priest would have lived and cleanse himself before entering the Miskan (Temple). 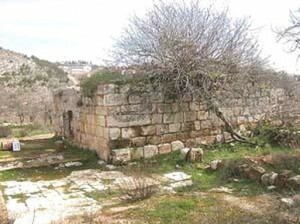 The actual location of the Miskan in Shiloh is also known but as you will noticed nothing is built there it is considered Holy. The outer walls slope inward and reach a height of two meters (6+ feet), giving the building the look of the Tabernacle of the wilderness where they were so use to assembling. It is much like other Synagogues found with three entrances in the northern wall, in the southern wall is the niche for the Holy Ark, facing Jerusalem. I know you can’t see to much by this picture, but this summer when they clear the winter growth some I will return and take a better picture. I know it is only a piece of ground, but I just wanted you to see this site, it means a lot to the Jewish world, it is where so much happened in the Tenach (Bible). We simply can’t give this to the enemies of God. We know that Joshua took this land from the Canaanites as he conquered most of the Holy Land. But the Arab’s who call themselves “Palestinians” have never had a claim to this land, the question is why would this government give it to them now as a reward for killing us? The Bush Road Map says this land must be given to the Arabs, his Road Map is really the Saudi Peace Plan designed to destroy Israel and he knows it.